Anthony Curtis was born in London 28 December 1798, to William Curtis and Mary Bishop. After serving in the RN, he came to Fremantle on board the Medina 6 July 1830. It's possible that his sister Paula Susannah was with him, as she was to marry Pilot Captain Edward Back (born 1815) probably not long after that date. Anthony Curtis was running the Black Swan Inn with John Bateman (who also arrived on the Medina) between Cantonment Street and the river in 1830, but it was apparently not successful. He was then licensee of the Stag's Head Hotel from 1833 (still extant in 1844), on Lot 106, which was on the SW corner of Pakenham and High Streets. (The building now on that corner is known as the Ajax Building.) Hitchcock records that Anthony Curtis was granted town lots 381 and 385. In 1836 at Fremantle he married Suzannah Glindon; they had two sons and two daughters. He died in Fremantle 11 January 1853. Cammilleri, Cara 1963, Anthony Curtis: His Life in Western Australia, 1830-1853 (typescript, State Library of Western Australia). Cammilleri, Cara 1966, Entry for Curtis in ADB. 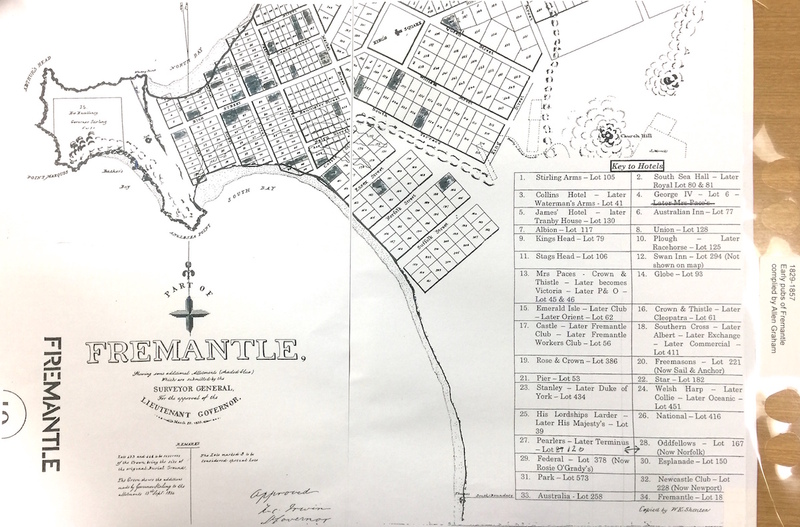 Map compiled by Allen Graham in the Fremantle Library collection showing Fremantle hotels 1829-1857. Thanks to Dianne Dench, a Back descendant, for many details.